Jan. 24, 2019, 9:36 a.m.
By Christine Schmidt @newsbyschmidt Jan. 24, 2019, 9:36 a.m.
Grandma adage aside, the comments matter, folks. Researchers at the Center for Media Engagement at the University of Texas found that uncivil comments on news stories can cloud a visitor’s perspective of a news site — even if more civil comments are presented first. 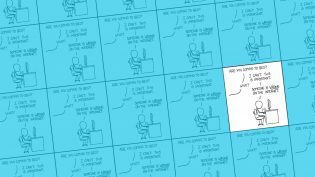 Experiments with more than 1,500 testers showed that people who only saw uncivil comments had diminished loyalty, value, and overall positive attitudes toward the news site in question. Readers who encountered majority-civil comments weren’t as disheartened, but with the internet these days, that can be a hurdle. “Merely starting a comment [section] with civil comments is not enough,” wrote Gina Masullo Chen, Shuning Lu, and Ori Tenenboim in the study’s report. What did uncivil comments look like? LOTS OF CAPS-LOCK-YELLING, profanity, and name-calling. (Behave yourselves in the comment section here, dears.) It wasn’t hard to find examples: The researchers drew, sadly, real comments from stories on immigration and climate change. 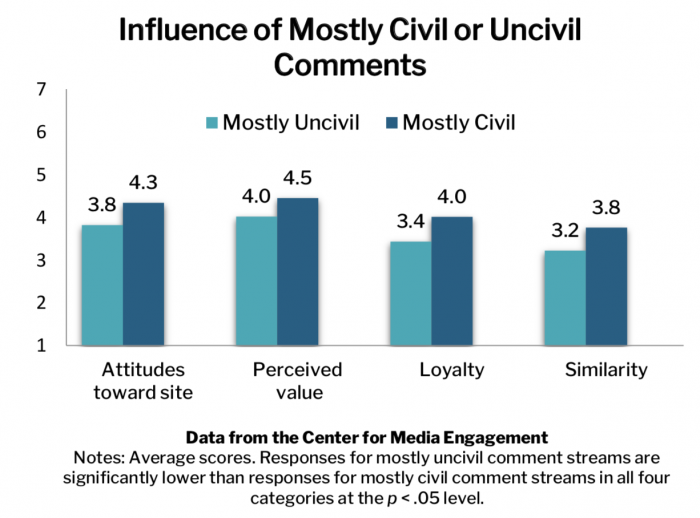 Our results suggest that incivility in comment sections can influence how people perceive a news organization’s brand — which is key to attracting an audience. The study shows that news organizations would benefit from improving comment sections. Some organizations have tried to deter incivility by encouraging journalists to highlight comments that are civil and thoughtful or to post the first comment to set a positive tone for a comment thread. These practices are worthy, but they may not be enough. News organizations should focus on the whole comment stream or at least the parts that are visible when people visit the site. Our research shows that audience members can handle some incivility when it does not dominate the comment stream. But when 75% of the comments are uncivil, people’s perceptions of the site and the commenting space were less favorable. This backs up the findings of a similar study by LSU’s Kathleen Searles, Augusta University’s Sophie Spencer, and Louisiana-Monroe’s Adaobi Duru published in November, which also used real comments. Those findings focused more on the gendered credibility hit for individual reporters (men’s and women’s credibility suffer equally! Surprise!). One of the real comments then: “More verbal flatulence from a known prevaricator. Mendacity on a galactic scale. It’s hard to fathom why or how anyone can be sucked into this cesspool of ignorance and self-aggrandizing fantasy.” Buuuuuuuurn. Some news organizations still see the comments as a priority — Vox Media brought The Coral Project, an open-source commenting moderation system designed by news organizations, into its fold earlier this week. 50 newsrooms currently use the project’s Talk platform for communities, and Vox Media plans to continue it as an open-source project. The comment sections aren’t playing games; they’re part of the battle to rebuild trust. Cartoon by XKCD used under a Creative Commons license. POSTED Jan. 24, 2019, 9:36 a.m.
Schmidt, Christine. "It doesn’t take a ton of nasty comments to sink a reader’s perception of a news site." Nieman Journalism Lab. Nieman Foundation for Journalism at Harvard, 24 Jan. 2019. Web. 20 Apr. 2019. Schmidt, Christine. "It doesn’t take a ton of nasty comments to sink a reader’s perception of a news site." Nieman Journalism Lab. Last modified January 24, 2019. Accessed April 20, 2019. https://www.niemanlab.org/2019/01/it-doesnt-take-a-ton-of-nasty-comments-to-sink-a-readers-perception-of-a-news-site/.